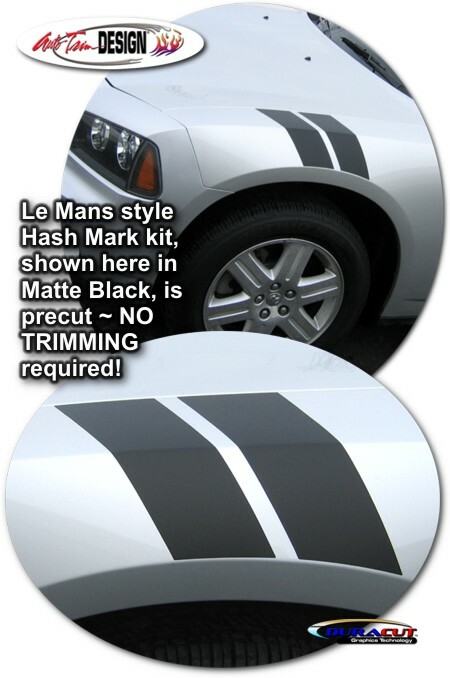 Trick out your '06-Current Dodge Charger with these simple yet aggressive "Le Mans" Style Racing Fender Hash Marks that are easily installed on either the Driver side or Passenger side front fenders - or order two (2) sets and do BOTH fenders! Designed to be placed a certain distance from the leading corner of the Fender front as noted in the Application Chart below, graphic is PRECUT and ready to install in a wide variety of colors - NO TRIMMING required! This Hash Mark kit is not just a set of straight strips. Our graphic kit consists of prefitted and contoured pieces that are specifically made for the '06-Current Dodge Charger factory Fender area and will not fit any other vehicle (straight stripes simply DO NOT work on the multi contoured fenders of the Charger). Please Note: Hash Mark kits are side specific. You must select Left or Right kits (based on sitting in the Driver seat) as desired. Designed to be placed a certain distance from the leading corner of the Fender front, measurements noted above serve as a reference for each year model. Dryfitting prior to application is suggested to become familiar with proper placement. Please refer to the Instructional Video in the Installation Instructions area of our site for more information.